The UK will not recognise the Catalan parliament's declaration of independence, Downing Street says. Theresa May's official spokesman said the declaration was based on a vote that had been declared illegal. The Scottish government said it understood and respected Catalonia's position. The UK prime minister's spokesman said in a statement: "The UK does not and will not recognise the unilateral declaration of independence made by the Catalan regional parliament. "It is based on a vote that was declared illegal by the Spanish courts. We continue to want to see the rule of law upheld, the Spanish constitution respected, and Spanish unity preserved." Catalan MPs backed the independence motion 70-10 in a ballot boycotted by the opposition. Spanish Prime Minister Mariano Rajoy had told senators direct rule was needed to return "law, democracy and stability" to Catalonia. Scotland's Cabinet Secretary for Culture, Tourism and External Affairs, Fiona Hyslop, said: "We understand and respect the position of the Catalan government. "While Spain has the right to oppose independence, the people of Catalonia must have the ability to determine their own future. "Today's declaration of independence came about only after repeated calls for dialogue were refused." Ms Hyslop added that direct rule was not a solution and that Spain's decision to impose it "should be of concern to democrats everywhere". She called on the EU to resolve the crisis peacefully and democratically. Shadow foreign secretary Emily Thornberry said the dispute had been turned into a "binary choice" between independence and direct rule. "It is not what the majority in Catalonia and Spain actually want," she said. "They want a sensible, political dialogue about finding a resolution." 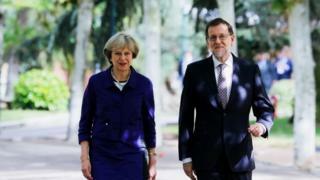 UK Foreign Secretary Boris Johnson earlier offered his support to the Spanish PM. After a meeting with Portugal's foreign minister in Lisbon, he said: "We don't think, as far as we understand the matter, that the referendum on independence was well-founded in law. "Therefore we remain very clear in our view that we should uphold the constitutional integrity and sovereignty of our Spanish friends and that's really our commitment and our pledge."